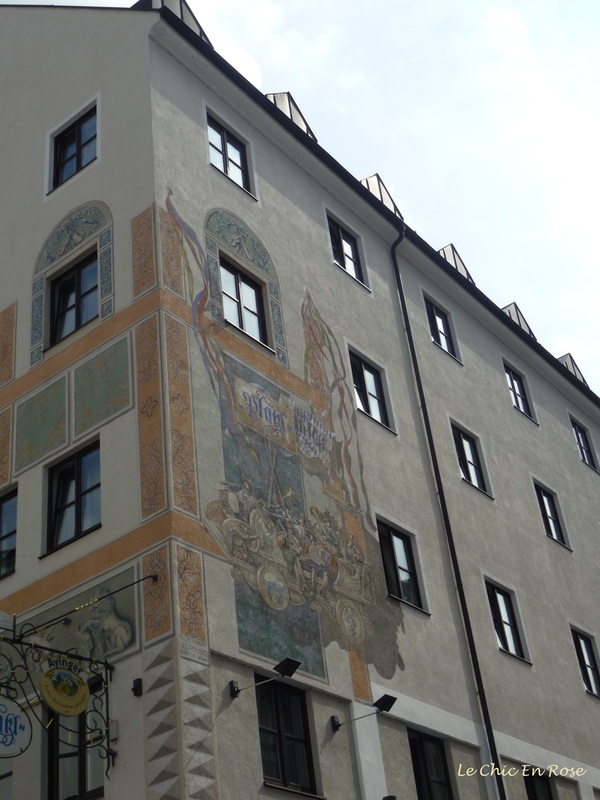 Our home from home whilst we were in Munich was the charming Platzl Hotel situated right in the heart of the Altstadt. We had debated whether to stay nearer the Hauptbahnhof as we planned to do several rail trips during our visit, but decided we’d much rather stay in the historic part of town near Marienplatz. It proved an excellent choice especially as we were laid low with the flu at the start of our trip and didn’t feel up to doing as much as we’d planned. We could go out and explore the old town for a while then pop back to the hotel for a rest! The entrance lobby to the Platzl is on Sparkassenstrasse, which can be a little confusing as the street at the back of the hotel, on which you will find Wirsthaus Ayingers (owned by the hotel) and the famous Hofbrauhaus (owned separately), is actually called Platzl. This area is in one of the oldest parts of town and there are many little side streets and cobbled alleyways to explore. Sooner or later you will find your way back to the hotel! Corner of Sparkassenstrasse and Muenzstrasse. The entrance lobby is just to the left of the picture. The Platzl has a lovely Bavarian country feel but with all the mod cons you’d expect in a city hotel. It is family owned by the Inselkammer family and apart from the hotel itself they also own a couple of adjoining restaurants, the Pfistermuehle and the Wirsthaus Ayingers plus the Aying Brewery just outside Munich. The breakfast room is on the first floor of the hotel but if you want to dine in the restaurants you will need to go out in the street and round the corner. All the room service food came from the Wirsthaus and we used that a few times early on in our trip when we still feeling the effects of the flu and didn’t want to go out in the evenings. Typical fayre were sausages of course or creamed mushrooms and seasoned dumplings, which was my particular favourite. The light and spacious breakfast room was a very pleasant start to the day. We were served coffee and tea by traditionally dressed staff – well the waitresses anyway who were all in dirndl and tracht. The waiters had smart aprons though rather than lederhosen. You helped yourself to whatever you wanted from the buffet – there was so much to choose from it was hard to decide what to have! There were “Wurst” of course, cold meats, cheeses, cereals including the Platzl’s own muesli recipe, fruits, eggs, numerous varieties of breads, jams …the list goes on. They also cater for different dietary requirements including food allergies and vegan options. Just off the foyer was the cosiest little bar, which served hot drinks throughout the day not just alcoholic ones! Our only gripe was that our room did not have tea or coffee making facilities even though we requested a kettle but we got round this by either getting room service or having a nice cuppa from the bar area. The foyer was rather like a large drawing room and a very convivial spot to take tea or coffee and people watch. We had a Double Deluxe room on the 5th floor. Now “double” in this context actually means 2 double beds pushed together to create 1 large bed (very common in German hotels) so it is more spacious than the Classic Queen Bed Room that our daughter Mlle had on the floor below, which was a fair bit smaller. We splashed out because we were staying 9 nights and wanted the extra space. Another advantage we found over the smaller and cheaper rooms was the aspect: we looked out towards the old town and hotel courtyard whereas Mlle overlooked Platzl (the street) and the Hofbrauhaus, which was quite noisy at times! Mlle was quite happy though (we were paying!). The other advantage we had on the 5th floor was that the hotel’s fitness centre was just along the corridor from our room. We had seen the signs to the “Maurischer Kiosk” and intrigued decided to investigate one day. It is a replica of one that King Ludwig II had installed in the grounds of one of his castles, the Linderhof Palace. He was apparently obsessed by the Orient and had purchased the Moorish Kiosk 9 years after first seeing it at the World Fair in Paris in 1876. Ludwig would dress up in Turkish robes and sit and read on cushions on the floor whilst being waited on by his servants in oriental attire too. I did brave the steam bath a couple of times and found it very therapeutic for my lingering cough – it certainly opened up the airways! I wasn’t game for the sauna though Monsieur tried it out! We felt very “at home” at the Platzl. Although they regularly hold business seminars and meetings here, it didn’t feel cold and corporate. On the contrary it had a very relaxed and welcoming vibe. Business people, tourists and families all mingled quite happily at breakfast. At night the lobby was lit up with candles and it made a lovely spot to have a nightcap before bed. Overall the Platzl was an excellent find and we’d be happy to stay here again should we be fortunate enough to return to Munich! It sounds perfect Rosemary, I always like the idea of a family owned place too, more appealing than the big chains. I’m drooling thinking about the dumplings and the idea of the candlelit lobby sounds really charming. Definitely one to remember!! Thanks Ken it had a lovely feel to it – they had modernised the decor without losing the traditional Bavarian charm! The hotel looks like a fantastic place, to relax and enjoy your holiday. It’s over 20 years since we visited Munich – if we go back, this looks like a great choice of hotel. Very nice hotel 🙂 Seems like you say very relaxing and with a lot of character. I always prefer central hotels too, when car parking is not an issue. Glad to hear you have had a great time Rosemary. You’re welcome, Rosemary. A good to week to you too!